The space-saving vacuum cup with a high holding force Handling of hot molded parts with ease: with these short-stroke vacuum cups, FIPA GmbH offers a further efficient solution for special handling tasks. Applications for these vacuum cups range from removing hot plastic moldings from injection molding tools through to handling workpieces with rough or grained surfaces. 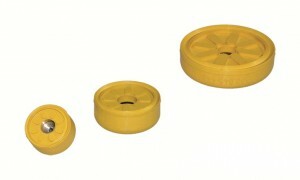 “The FIPA short-stroke vacuum cups represent a highly versatile solution component”, says Rainer Mehrer, CEO of FIPA. vacuum cups in the smallest space. A typical application for short-stroke vacuum cups is the removal of hot plastic parts from the tool mold of injection molding machines. If the molded parts are for the instrument panel, these are usually grained. In this case a FIPA short-stroke vacuum cup from HNBR is the right choice: it offers a temperature tolerance range from -30°C to 160°C and high suction power. And for handling parts with rough surfaces such as rubber mats, cardboard packaging, wood or stone, FIPA short-stroke vacuum cups are particularly suitable. PWIS- and silicone-free with HNBR: Paint-wetting impairment substances (PWIS) are not permitted for use with products that will later be painted or coated. The low-marking FIPA short-stroke vacuum cups from HNBR meet this requirement. Low wear: Thanks to the perpendicular suction lip, short-stroke vacuum cups are not subject to lateral sliding movements. This results in minimal abrasion and thus a long cycle life. Ideal for rough and grained surfaces: Thanks to the dovetailed double sealing lip, FIPA short-stroke vacuum cups develop a high suction force even on rough or grained surfaces. Where workpieces are to be handled at normal temperatures and there is no need for PWISfree treatment, short-stroke vacuum cups in NR (natural rubber) are the best choice. With a hardness of only 40° Shore A they nestle closely to the workpiece and develop a high holding force even on very rough surfaces. FIPA finds the right solution for every vacuum cup application – this can be seen in the extensive range of vacuum cups we offer.